How many do you expect Arians to win in ’19? Arians has had a first-year success before. There was a new energy, a new coach, a new direction. Yep, the Tampa Bay Bucs had it figured out, didn't they? It was 2009, and the Bucs had made changes. Jon Gruden had won a Super Bowl once, but his team was running in place, and Raheem Morris was a hot new assistant the team feared losing. And so, even though Gruden's 9-7 record was the same it had been the season before when he was given a contract extension, he was fired. So was general manager Bruce Allen, who was moved aside to make room for Mark Dominik. It sounded good on paper, didn't it? Morris was going to prove it, wasn't he? He was going to win. He was going to start something. And he won three games, a third of Gruden's total for the previous season. The sad truth is that most coaching changes don't lead to the Super Bowl. Sometimes, if you are the Jets, you get Rich Kotite. Sometimes, if you are the Dolphins, you get Cam Cameron. Sometimes, if you are the Browns, you get Hue Jackson. If you are the 49ers, you get Chip Kelly. And soon, you are changing coaches again. Once, the San Francisco 49ers had been the best team in football. No more. Back in 2011, it had been nine seasons since they had a winning record. Once the land of Bill Walsh and George Seifert, there were no-name coaches in a revolving door. Once the land of Joe Montana and Steve Young, you had Trent Dilfer and Shaun Hill. The new guy was going to clean it up, right. Jim Harbaugh had just blown into town, and things were going to be different. In 2011, the 49ers went from 6-10 to 11-5. They lost in the conference finals, by three points to the Giants. Want to know just how far they came? The year before, they lost to the Bucs 21-0. That year, they beat the Bucs 48-3. Yeah, it can work. It's rare, but there are seasons to point to. So what should we expect in this first season of Bruce Arians? Oh, it will be interesting; we know that. The NFC South seems to be declining; three teams had losing records this year and the fourth has a 40-year-old quarterback. But we don't yet know who the Bucs will sign as free agents, or who the draft picks will be. Picking a record now is like picking a number out of a hat. And while Arians has made it clear he won't blame the talent, we know better. We've seen this secondary. We've seen this offensive line. We've seen the interceptions and the penalties and the struggles in the red zone. Arians has some heavy lifting in front of him. But don't you think Tony Sporano had some heavy lifting to do in 2008 when he took over the Miami Dolphins? Cam Cameron had won just one game the previous seasons. Sporano won 11 and made the playoffs. In 2005, the Saints went 3-13. Sean Payton came in, and the Saints improved to 10-6 and made the conference finals. In 1991, the Chargers won four games. Bobby Ross came in and led his team to an 11-5 finish and the playoffs. In 2004, Jim Mora took over the 5-11 Falcons and turned them around to 11-5 and the conference finals. Chuck Knox, in his first stint with the Rams in 1973, took over a 6-7-1 team and led them to a 12-2 season and a spot in the conference finals. Yeah, it's hard to turn a team around. Most of them follow in the same footsteps of their previous journeys. Sometimes, it seems as if the losing is a life sentence. But every now and then, someone so dynamic has such a solid plan in place that he exceeds expectations. We've seen it before, of course. No matter where you lie with the old Tony Dungy-Jon Gruden argument, there is no question that Gruden's job in 2002 was masterful. He came in not knowing the names of his players, and he gave them new energy on their way to a Super Bowl title. Sure, the Bucs were a nine-team win the year before he came (Gruden won 12, plus three in the playoffs). But there was a sameness to Dungy's last couple of seasons. The defense was amazing, the offense was never good enough to get the team over the hump. Over the years, however, first-year Buc coaches haven't done well. John McKay didn't win any in his first season. Leeman Bennett won two, or a third of McKay's last year. Ray Perkins won four. Richard Williamson won three. Sam Wyche won five. Dungy won six. Raheem Morris won three. Greg Schiano won seven. Lovie Smith won two. Dirk Koetter won nine, at least.He and Gruden had the only winning records for a first-year coach. Again, it happens. In 1970, Don McCafferty took over Don Shula's Colts team, which was 8-5-1. McCafferty led them to an 11-2-1 record and a Super Bowl win. Barry Switzer was 12-4 with the Cowboys in his first year, but he lost in the conference finals. That looked bad, since Jimmy Johnson had won back-to-back Super Bowls in the previous two seasons. George Seifert won the Super Bowl in his first year; however, the 49ers had won it the year before when he was an assistant on the staff. McCafferty also came from within, which means he had a better inkling of his players. (Yes, George Halas and Paul Brown were very good in their first seasons in the NFL. However, the league was new when Halas started coaching the Bears. The Browns dominated the AAFC and were a top team by the time they joined the NFL). A reason to hope? Heck, Bruce Arians has done it before. In 2013, he took over the Arizona Cardinals, a 5-11 team with a history of wobbly ownership. The Cardinals lost the Super Bowl in 2008, but except for that, they had one playoff appearance in 25 years. Arians took his first team to 10-6 and won 34 games in his first three years. If that wasn't enough, Arians' defensive coordinator with the Bucs, Todd Bowles, also had a nice first season with the New York Jets. They went from 4-12 the year before he arrived to 10-6 in his first season. It doesn't always happen. Look at last season's first-year coaches. Chicago's Matt Nagy turned the Bears from a five-win team to one that won 12. Frank Reich of Indianapolis took his team from 4-12 to 10-6. Both teams are in the playoffs. But Detroit's Matt Patricia fell from nine wins to six. Arizona's Steve Wilks went form eight wins to three (and was fired). Oakland's Jon Gruden went from six wins to four. Mike Vrabel of Tennessee won nine games, the same as the Titans had won the year before. And the Giants' Pat Shurmur improved from three wins to five, hardly worth a parade. The point is, success is possible, even if it hasn't been seen locally for a while. Dennis Green inherited an 8-8 Minnesota team in 1982; he led his first team to 11-5 and the playoffs. Bill Cowher took over a 7-9 Pittsburgh team in 1992 and led it to 11-5. In 2008, John Harbaugh (Jim's brother) took over a 5-11 Ravens team and led it to 11-5. Back in 1970, Don Shula took over the 3-10-1 Miami Dolphins and led them to a 10-4 record. It's uncommon, but it's not rare. Over their history, the Bucs have hired a lot of wrong guys. This time, they have to hope they have the right guy. If so, success is possible, even this year. 2004 Falcons 5-11 11-5, Conference Finals Jim Mora Jr. I agree that expectations have to be tempered with the Bucs losing mentality. Injuries, lack of depth, disappointing draft pics and free agent signings that often fall flat all lead to losing seasons. And the QB still has to prove he has what it takes to win games and not jut put up good stats. Jameis says he wants to get back to being Jameis Winston and to me that says he hasn’t learned much in the NFL. The Jameis we all have come to know hasn’t protected the ball well and doesn’t put up a lot of TDs. Arians says his job is to get Winston to play smarter. I believe he’s going to find that’s easier said than done. I agree with you. I think what Winston was doing, however, is spouting cliches. He has a habit of that. He didn’t think about the question or his answer. He just answered by rote, giving nothing away. I don’t think there is a thing to be gained by dissecting it. Yes, he needs to protect the ball better. But the Bucs have to get a thousand times better around him. How many games did the secondary win (none). How many games did the running attack win? The offensive line? We can go on for a while. The Bucs aren’t great at quarterback, but they’re lousy everywhere else. Remember the Atlanta game? Winston passed the Bucs into the lead with 5:10 to play and never got the ball again. The Falcons ate up the clock and kicked a field goal to win it. I’m not defending Winston. I’m merely saying that he’s not the only problem around here. I agree with that. The OL has to block better so the running game can contribute more and the defense definitely has to be better. There will be games where the QB has to be heroic and we’ll see if Winston can come through when needed. Remember the Rams / Chiefs game this year? The Rams had to score 50+ points to win but they got it done. Sometimes the QB has to go out and win it but over the long season the entire team has to do their job. No question. Winton needs to be better, but a lot of other people do, too. No debate there. So no real prediction yet! Too soon as you say. Let’s wait until after the draft and see who they pick up in veteran signing.! One thing is probably a sure bet. 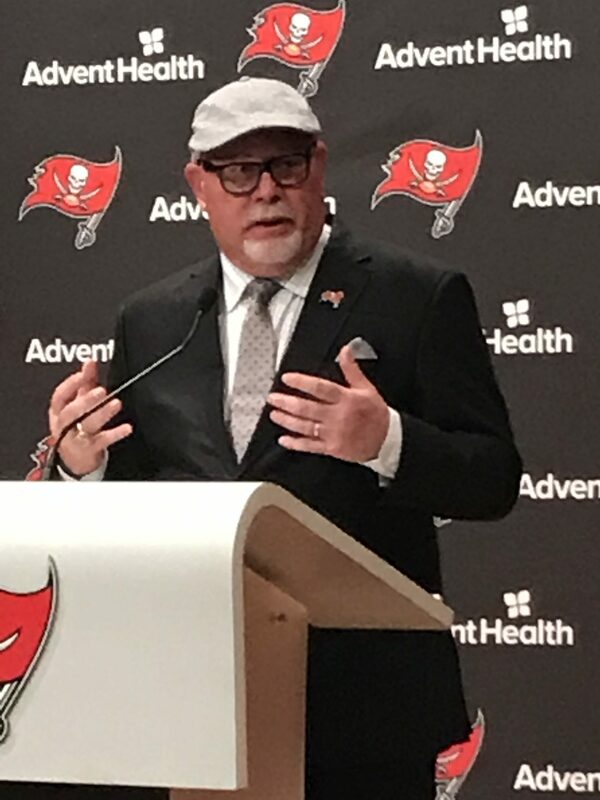 If 2019 is not a winning season for the Bucs then Winston will be first out the door if he lasts that long. You aren’t the only guy who is getting tired of this team not winning under Winston, but it’s tough for me to agree that he’s out of here if the team has a losing record. A record alone doens’t indicate how he plays, or how much he improves, or how the other parts of the team play. I agree it’s time for him to win. Otherwise, his money is going to get very big very fast. But let’s see how he does. Then you can light the torches. Enjoyed this piece. I have learned a long ago as a Bucs-follower to have low expectations; this approach leads to less disappointment. Oh, it all leads back there. We know that, right. Lol.